The theoretical case for patents is clear enough: if you want people and companies to have an incentive for investing money and time in seeking innovations, you need to offer them some assurance that others won't immediately copy any successful discoveries. But with the power of patents comes the risk of gaming the patent system and of patents being granted when the proffered invention is either not new, or obvious, or both. Michael D. Frakes and Melissa F. Wasserman tackle these issues in "Decreasing the Patent Office’s Incentives to Grant Invalid Patents" (Hamilton Institute Policy Proposal 2017-17, December 2017). Also, Jay Shambaugh, Ryan Nunn, and Becca Portman offer some useful background information in "Eleven Facts about Innovation and Patents" (Hamilton Project, December 2017). The Shambaugh, Nunn, and Portman paper offers a few background figures on patents that, as you look, at them, can raise your eyebrows a bit. The background here is that three main patent-granting agencies in the world--the US Patent Office and Trademark Office, the Japanese Patent Office, and the European Patent Office--are sometimes referred to as the Trilateral Patent Offices. The usual belief is that "compared to the USPTO, the JPO and EPO are believed to apply stricter scrutiny to applications." Getting a patent from all three of these offices is called a "triadic" patent, and the number of triadic patents is sometimes used as a measure of quality. Now consider a couple of comparisons. 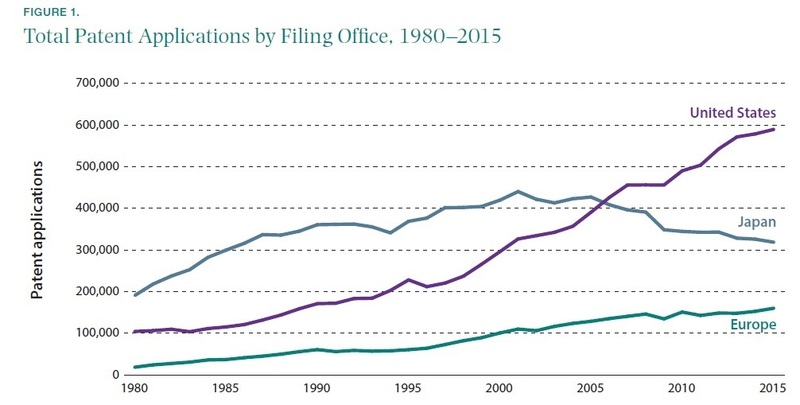 The number of patent applications in the US had more-or-less doubled since 2000. In that time, the number of patent applications in Japan has dropped by one-quarter, while the number in Europe has risen by about 50%. One possible interpretation of this pattern is that the US economy is the grip of a massive wave of innovation far outstripping Japan and Europe, which may foretell a productivity boom for the US economy. An alternative interpretation is that it's so much easier to apply for a patent in the US, and to have a patent granted, that the US Patent Office is attracting lots of low-quality and invalid patent applications, and some of those are sneaking through the system to receive actual patents. Here's a figure that poses a similar question. This graph shows the share of GDP spent on research and development on the horizontal axis. The vertical axis is a measure of the number of "high-quality" patents, which in this figure refers to an innovation that is patented in at least two of the three Trilateral Patent Offices. 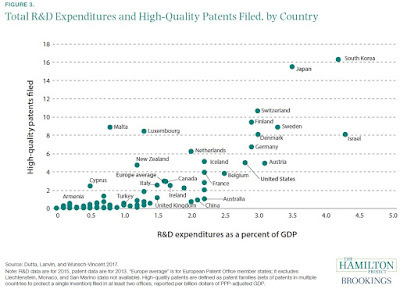 The US level of R&D spending is a bit below that of Germany and Japan, but similar. 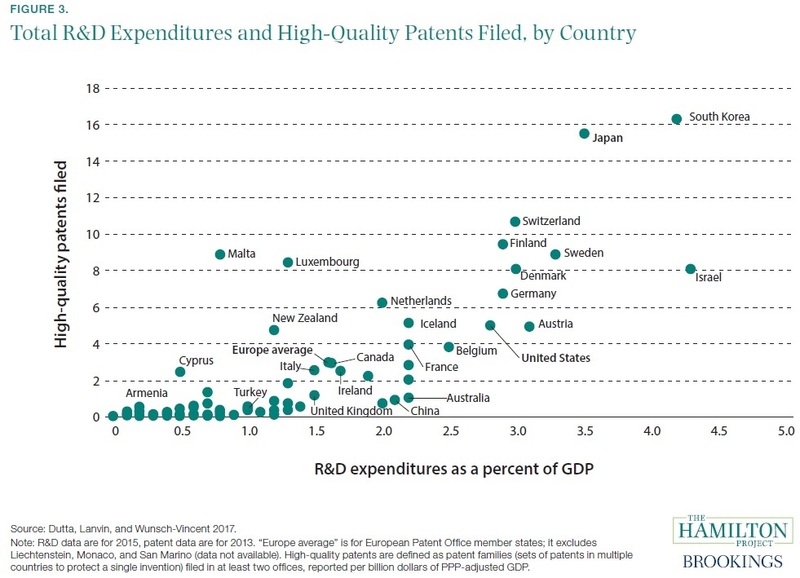 However, when measured in terms of high-quality patents filed, the US lags well behind. Again, this could be the result that US firms aren't bothering to apply for European and Japanese protection for all their great patents. Or it could be a signal that the rise in US patents includes a greater of low-quality or even invalid patents than those in Japan and Europe. "There is an abundance of anecdotal evidence that patent examiners are given insufficient time to adequately review patent applications. On average, a U.S. patent examiner spends only 19 hours reviewing an application, including reading the application, searching for prior art, comparing the prior art with the application, and (in the case of a rejection) writing a rejection, responding to the patent applicant’s arguments, and often conducting an interview with the applicant’s attorney. Because patent applications are legally presumed to comply with the statutory patentability requirements when filed, the burden of proving unpatentability rests with the Agency. That is, a patent examiner who does not explicitly set forth reasons why the application fails to meet the patentability standards must then grant the patent." "The overwhelming majority of Patent Office costs are attributed to reviewing and examining applications. To help cover these expenses, the Agency charges examination fees to applicants. These fees fail to cover even half of the Agency’s examination costs, however. To make up for this deficiency, the Agency relies heavily on two additional fees that are collected only in the event that a patent is granted: (1) issuance fees, paid at the time a patent is granted; and (2) renewal fees, paid periodically over the lifetime of an issued patent as a condition of the patent remaining enforceable. Combined with examination fees, these fees account for nearly all of the Patent Office’s revenue. ... In fiscal year 2016 the Patent Office estimated that the average cost of examining a patent application was about $4,200 . The examination fee that year was set at only $1,600 for large for-profit corporations; at $800 for individuals, small firms, nonprofit corporations, or other enterprises that qualify for small-entity status; and at $400 for individuals, small firms, nonprofit corporations, or other enterprises that qualify for micro-entity status." An obvious concern is that if the US Patent Office relies heavily on fees that are collected only after a patent is granted, then there is an obvious incentive to grand more patents. Indeed, they cite studies to show that when the Patent Office is facing financial troubles, it tends to grant more patents. An additional concern is that the US Patent Office doesn't really reject patents, at least not permanently, because you can apply repeatedly. 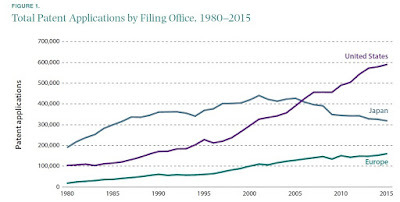 "Considering that about 40 percent of the applications filed in fiscal year 2016 are repeat applications (up from 11 percent in 1980), a substantial percentage of the Patent Office’s backlog can be attributed to its inability to definitively reject applications." To put it another way, an applicant for a patent can just keep applying until it gets assigned to a less-experienced examiner during a budget crunch, and improve your odds that it will eventually be granted. With these thoughts in mind, Frakes and Wasserman offer some practical solutions, which include: 1) increase patent examination fees and abolish "issuance" fees, to reduce the financial incentive to grant patents; 2) limit repeat applications, perhaps by charging higher fees; 3) give patent examiners more time (and charge higher fees to support that additional time as needed). "Although patents encourage innovation by helping inventors to recoup their research and development expenses, this comes at a cost—consumers pay higher prices and have less access to the patented invention. Although society can accept such consequences for a properly issued patent, an invalid patent imposes these costs on society without providing the commensurate benefits from additional innovation because, by definition, an invalid patent is one issued for an existing technology or an obvious technological advancement. Invalid patents provide no innovative benefit to society because the public already possessed the patented inventions. "In addition to this harm, erroneously issued patents can stunt innovation and competition. Competitors might forgo research and development in areas covered by improperly issued patents to minimize the risk of expensive and time-consuming litigation. There is growing empirical evidence that invalid patents can increase so-called patent thickets—dense webs of overlapping patent rights—that in turn raise the cost of licensing and complicate business planning. Because a firm needs a license to all of the patents that cover its products, other firms can use questionable patents to opportunistically extract licensing fees. There is mounting evidence that nonpracticing entities—commonly known as patent trolls—use patents of questionable validity to assert frivolous lawsuits and extract licensing revenue from innovative firms. Invalid patents can also undermine the business relations of market entrants because customers might be deterred from transacting with a company out of fear of a contributory patent infringement suit. Finally, erroneously issued patents can inhibit the ability of start-ups to obtain venture capital, especially if a dominant player in the market holds the patent in question."